A Proven Producer who stamps his offspring with his own qualities, most importantly, temperament and train ability .............. easily seen when you look at this mare. Prestige was undisputed Champion of his Stallion Approval in Sweden in 2001. Approved KWPN with high gait and talent scores in 2003. 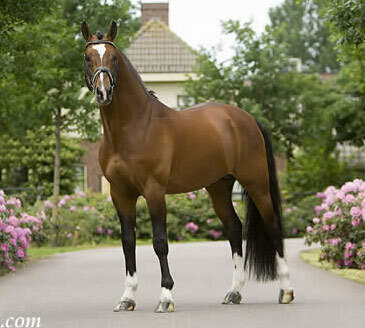 In 2004 he was Champion of the KWPN Stallion Competition at Z (medium) Level. He is very talented for the Grand Prix work and his temperament is faultless. Prestige has a reputation in Europe for producing offspring with a good front end, size and powerful gaits that move uphill with a lot of power from the hindleg. They are very good types with beautiful exteriors and are very willing to work. Her dam Rosewood, talented in her own right, moved through the ranks of Eventing to Open Novice horse trials prior to unfortunate circumstances.